Had Travis McGee been in a science fiction novel, we would have had books like The Philosophy of McGee, similar to The Notebooks of Lazarus Long, dedicated to the wit and wisdom of this, MacDonald’s best known and best loved character. Perhaps it is for the best. While not quite given to epigrams as Robert Heinlein, MacDonald definitely had a consistent vision of who this latter day Don Quixote was. Long before Robert Parker investigated male angst in the Spenser books, MacDonald had mined the entire territory. 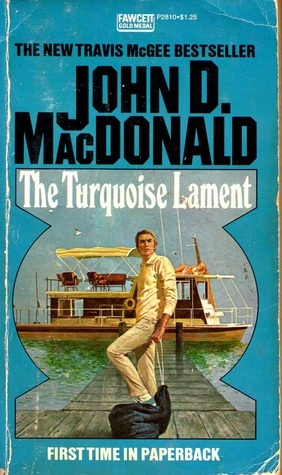 In The Turquoise Lament, McGee must face doubt, guilt, and faith as the grown daughter of a deceased salvage friend is afraid that her newlywed husband is attempting to kill her. Culminating in a fight scene with a cable car that today’s Hollywood would go nuts for–in fact, that gets me to wondering why we have never seen McGee on film. Maybe we have, and I just don’t know about it? Sure, some of the dialogue might not work on the screen, but the mystery, adventure, and spectacular fights would surely fit today’s current vehicles for male stars. Today’s directors would probably make a mish-mash of it, though; MacDonald probably better fits a director like Alfred Hitchcock than Paul Verhoeven or James Cameron.